Hey, why is the EAP field and its processes so confusing after over 30 years of being an established and legitimate occupational pursuit? Answer: A lack of detailed and enforced standards and sanctions for misapplied EAP core technology priniciples that hurt employees, cause loss of jobs, and dismantle the EAP profession. I am convinced, anyone can call anything they want an EAP and recognized associations, even if you are a member of them, won't give a hootily. Just pay your dues on time. When I get the inkling to discuss this topic, I only have to Google a specific term and up pops a great example of what I am talking about. STEP 1: HR (not the supervisor!) calls _________EAP to discuss the purpose for the referral and requests a blank Supervisory Referral Form if needed. STEP 6: ________EAP Clinical Manager contacts provider and HR/Supervisor to begin the process of mediation between the provider and HR regarding the employee’s treatment plan and progress. I don't know if you were counting, but there are a total of 8 humans involved in this referral not counting the employee. 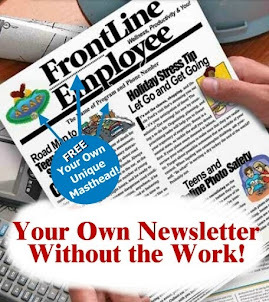 If you missed the person who is assigned to email or fax the supervisor form, you're simply not on your toes. How many supervisor referrals to you think this provider receives as a percentage of total referrals to the EAP during the year? True confession: I worked for a company for 11 months in 1995 (I won't mention the name here, but you can visit my resume to find out.) and they had an almost identical process. That organization's supervisor referrals were close to ZERO! A supervisor referral is a simple thing. And, it's powerful. But add in bureaucratic hoops and fire rings to create a circus and your utilization rate will flop. Worse still, behavioral risk with the folks that might go "postal" or have other problems that cause financial loss will increase. 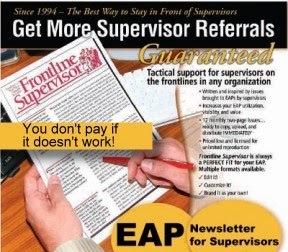 STEP 1: A supervisor referral simply uses the application of authority or leverage of job security to motivate a troubled employee to accept the exciting opportunity to be accommodated and assisted by the EAP to get help for a possible personal problem in lieu of the possibility or immediately pending disciplinary action for documented job performance or conduct problems. STEP 2: The EAP is notified, preferably, but it won't and can't interfere with the supervisor referral and the employee's responsibility to act. Documentation is given to the employee and the EAP, and a release is requested to be signed by the employee to verify participation and cooperation with whatever is going on at the EAP. A release is essential to good EAP work, but what if you can't get it? Remember, EAPs are voluntary. Well, answer: It isn't needed or necessary if the employee doesn't want to verify attendance and cooperation (which can easily be explained by the EAP or the supervisor as not a smart choice.) 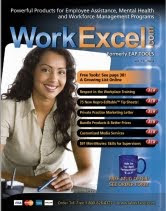 Verifying attendance and cooperation is to the employee's benefit. No organization is handicapped without a release. That's the sum and substance of a supervisor referral. One human involved, plus the employee being referred will make it work beautifully with an EA professional at the other end. The key is making the employee responsible for change and accountable for change. Supervisor follow-up is key. A breakdown in communication and bureaucratic snarling in supervisor referral process translates to an erosion of the employee's perception of accountability for change.